Post surgery aids are different tools that can be used in the hospital and in the home to make life easier for patients as they go through the recovery process. They may be used during the time immediately after surgery when the patient is going through the beginning stages of recovery, as well as on a continuing basis to aid in the later stages of recovery when the patient is attending physical therapy sessions. Post surgery aids can improve several different areas of a person’s life. One area is mobility. Make sure to get the mobility aids after surgery or before surgery to improve your qualify of life and shorten recovery time. They allow a person to do more things in life that would not be so easy to do otherwise. By giving a person the tools they need, they can accomplish more and therefore be more fulfilled in life. Raised toilets are one type of post surgery aid available. Raised toilets can either come in the form of a chair with a receptacle at the bottom to catch bodily waste (handicap commodes), or as an attachment that fits directly onto an existing toilet seat (raised toilet seats). The height of a toilet seat after surgery should be high enough so there is less bend at the hip; 17 to 19 inches is optimal. 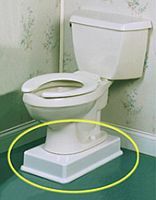 You can also put in bottom install toilet riser seats that adds 4 inches from the ground. They are ideal for patients who have problems sitting down, getting up and walking to their bathroom. People who recently had hip surgery, knee surgery or abdominal surgery and do not have the strength to sit down and stand up on their own will gain the most benefits from these post surgery aids because there is more assistance and less strain on those recovering areas. 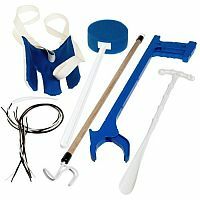 There are deluxe hip kits for post hip surgery patients that contain items that reduce the amount of bending and stretching. These items include sock aids, a reacher, dressing sticks, shoe horns and long handle bath sponges. They are the perfect all in one gifts for post hip surgery persons. Seat Lifts And Cushions For After Hip Surgery – If you have trouble standing up and sitting down, buy some seat cushions after hip surgery. Wound and Cast Protectors – Keeps your casts and wounds dry when you are showering. Toilet Seat Cushions – Great cushions after surgery for reducing the pressure on those sensitive areas. Another benefit of post surgery aids is the opportunity for the patient to have more independence during the healing process. People generally like to feel independent in most situations, and surgery is no different. Post surgery aids may also be helpful for those with permanent physical disabilities. For example, consider a person who is paralyzed from the waist down. A raised toilet may make life easier by allowing that person to get up more quickly and easily. Post surgery aids vary in cost from item to item, but many are covered by insurance. Some basic maintenance is also required, which usually consists of simple things like cleaning and replacement of parts due to general wear and tear, depending on the product.